Printed from http://www.bodytalksystem.com//learn/news/article.cfm?id=831 on Apr 22, 2019. Some extraordinary ideas are likely to emerge from this course. As important as these ideas are, it is equally important that we be able to articulate them to individuals who are steeped in older scientific traditions or who have completely different interpretations of the modern science. Specifically, most people today view the world from the perspective of classical or Newtonian physics. - Objects move when you apply a force to them. - Light travels at a velocity of 186,000 miles per second. - The sun, moon and planets move in predictable orbits. - The energy from breakfast powers our thinking and movements. - DNA is the blueprint for the body. - Mind and Consciousness are the products of the brain. In this course we will be introducing exceptional ideas and interpretations from quantum physics, and they are VERY different from classical physics. All of us, and all parts of our bodies, are continuously exchanging information with the morphic field. This information is generated by and absorbed by every part of your body and also by every object in the universe, near and far. This presentation is a summary of the evidence and of the concepts that support these remarkable ideas and how they apply to BodyTalk. Hang on...this one will knock your socks off! "If I heard someone give this lecture, I would think they were NUTS! But all the pieces fit together. 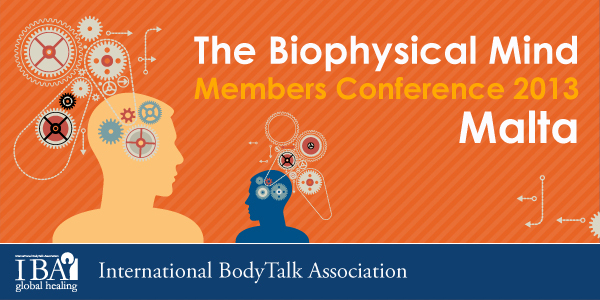 It is really remarkable how all the discoveries from quantum physics to cosmology, and everything in between, support the work being done with BodyTalk. Albert Einstein gave me moral support, when he asserted, 'If at first, the idea is not absurd, then there is no hope for it." - James L. Oschman, Ph. D.
The Biophysical Mind with John Veltheim and James L. Oschman is open to public in Malta October 31st - November 3rd. LiveStream also available - take course from your own home!